By 1997 the PowerPC 604e was getting a bit dated. Apple needed an updated faster processor for their new computers and IBM and Motorola needed a new processor to sell to Apple. The PowerPC 750 was an evolution of the 604e and became the core of Apple’s various G3 systems. In early 1997 Apple , IBM, and Motorola (together known as the AIM Alliance) were working on what would become the PowerPC 750. It’s code name? The Arthur. Apparently someone at IBM or Motorola had a liking for Sherlock Holmes as the 745 was codenamed Conan and the 755 Doyle, after Sir Arthur Conan Doyle, writer of Sherlock Holmes. 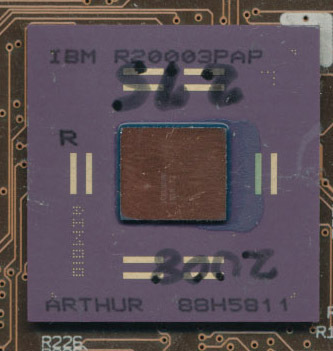 This particular part is date coded R20003PAP which means it was made in mid-May of 1997, 6 months before the G3 and PowerPC 750 were officially released. The card the Arthur processor (hand labeled 300Mhz) resides on is an Apple Prototype known as the Goleta. The Goleta was one of the first Apple G3 products. It was to be used in the PowerMac 9700 aka the PowerExpress which was to be a 6 slot G3 PowerMac running at 275MHz. Apple Goleta G3 Prototype – Click here to see the full card. It never made it past the prototype stage. 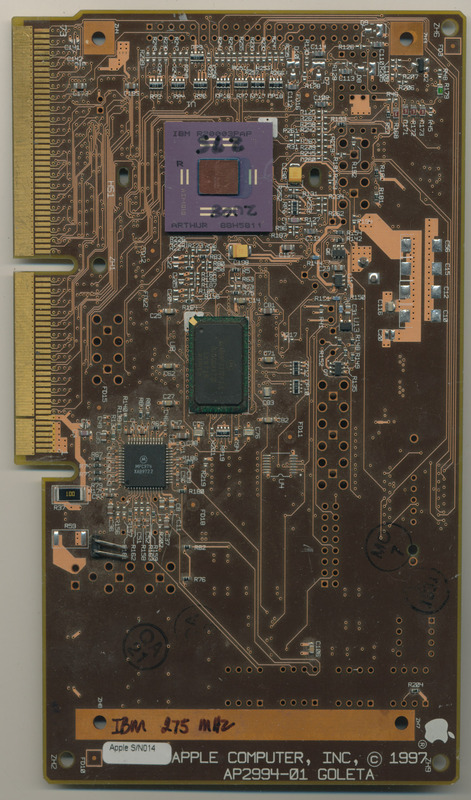 The card is labeled as serial #014 making it a very early prototype, though how many total were made is not known. The card may have been used at Apple for testing other deigns as well and certainly was a test bench for the new 750 PowerPC Processor. This was a chaotic time for Apple as they were struggling to pull out of near bankruptcy. Steve Jobs had only just returned to the company and radically changed what Apple was doing, and what they were not doing (making money). 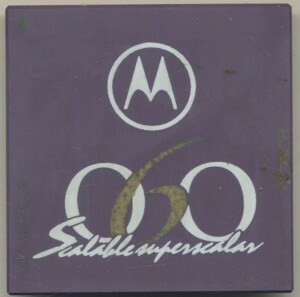 The Motorola 68060 was the last of the 68k line that was begun in the late 1970’s. The 68k began as the first commercial success of a 32 bit processor. It wen through many upgrades, essentially proving to be worth competition (and likely a better architecture) to Intel’s x86 line. The ‘060 was the first 68k to bring a superscalar architecture. It could issue multiple instructions per clock, in some ways it was better then the Intel Pentium. The 68060 was released in 1994 but never achieved wide success. 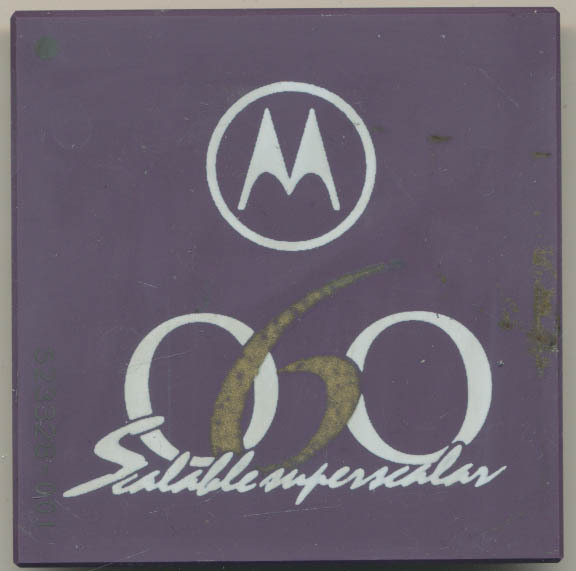 By the time of its introduction Motorola had thrown most of its weight behind the PowerPC of the AIM Alliance. Eventually the 68060, which was released on a 0.6micron process at 50MHz, would be moved to 0.42 micron and hit 75MHz. It, unfortunately, suffered the same fate as the 88000 RISC processor, a slow but inevitable fading away. 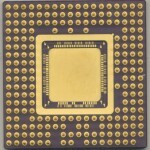 The 68k line (mostly the 68000 core, or its derivative, the CPU32) lives on in many of Freescale’s products. The chip shown is what is known as a Marketing Sample. These typically were only an empty package, given to sale people and distributors as gifts or sales aids. They typically feature a flashy logo, more color, and often, like this one, a sales pitch. ‘Scalable Superscalar’. It seems that the 68060 proved less salable then it was scalable. 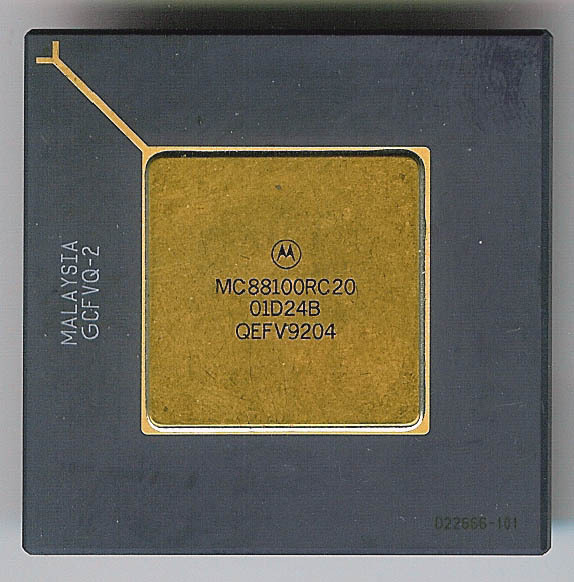 In the late 1980’s Motorola was developing a full 32-bit RISC processor from the ground up. Initially called the 78000, it was renamed the 88000. The first implementation of the 88000 Instruction Set Architecture was the 88100. It included a FPU and integer unit but required a separate chip (the 88200 CMMU) for caching and memory management. Typically 2 of the 88200s were required (one for instruction cache, one for data, 16kb of cache each). A 64lb cache was also available called the 88204. 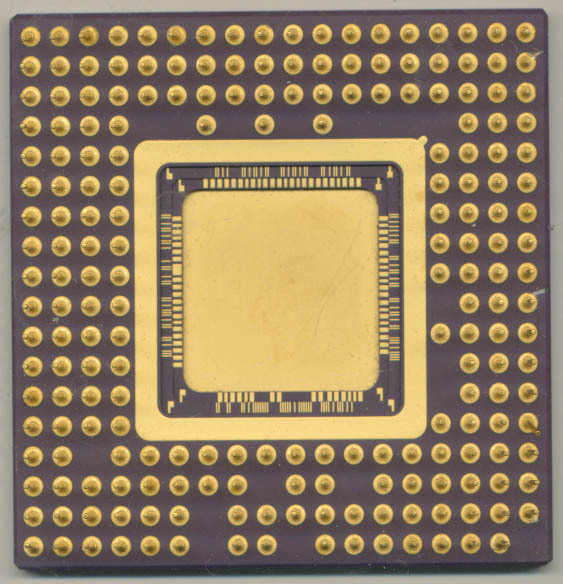 Made on a 1.5u process the 88100 contained 165,000 transistors while the CMMU chips contained 750,000. Each chip dissipated 1.5Watts at 25MHz. Prices in 1989 were $494 for the CPU and $619 each for the CMMUs. A complete system of 3 chips would be nearly $2000. Not exactly competitive pricing. The initial, and biggest, customers for the 88000 were to be Apple, and Ford Motor Company, an unusual combination to say the least. Apple invested in the 88000 to be the replacement for the 680×0 processors it had been using. Ford was looking to replace the Intel 8061 processors (from which the MCS-96 MCUs were developed) that had run their EEC-IV engine computers since the early 1980’s. Motorola (as well as Toshiba) had been second sourcing these for Ford for sometime. Ford based its choice on the 88100 based ECU on the assumption that Apples adoption of the 88100 would guarantee good software and compiler support. 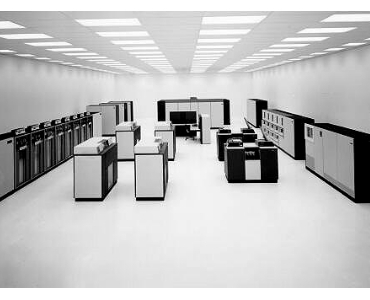 If Apple stuck with it that is..
IBM introduced the 12.5MHz cabinet sized System/370 in June 1970 as an evolution of the System/360 from 1964. These systems formed the entire base of IBM’s mainframe business. Today’s System z, itself an evolution of the original System/360 and 370, can still run many of the original programs, unmodified, from 50 years ago. This is a testament to 2 things, the wide adoption of the IBM systems, and the forward thinking of IBM. Even the original System/360 from 1964 was a full 32-bit computer. Single chip processors did not embrace 32 bit architectures until the very early 1980’s (Motorola 68k, National 32k, etc). 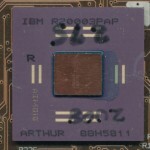 In 1980 IBM sought to make a single chip version of the 370, in an effort to make a version that could be used for desktop type computers. This was to become the Micro/370. There were 2 distinct products to come out of this goal that are widely confused and debated. The first became the PC XT/370, an add in card(s) for an IBM PC to give it the capability to run System/370 software. Later another version was developed called the Micro/370 as a single chip solution. The PC XT/370 began as an experiment, a test bed implementation of the System/370 in a microprocessor environment. The goal was not to rebuild the 370 from the ground up (that would come later) but to merely implement its instruction set into an existing design. The base processor had two main requirements: it had to be 32 bits, and it had to be microcoded. IBM’s engineers in Endicott, NY selected the then very new Motorola MC68000 processor as their basis. It was one of the only 32-bit designs at them time so that no doubt helped in the selection process.